Happy Monday! I’m here today with something new inspired by a song that always comes to mind this time of year – My Favorite Things from The Sound of Music! Last year I made a large sign for my mantel with the lyrics from this song. You know that I love signs that are inspired by song and hymn lyrics, but I’ve been struggling with a few things. Making hand painted signs to sell takes me away from my blog and these large signs are pretty expensive for the average person. This is one reason why I closed my Etsy shop earlier last year. I wanted a break from sign making to figure out a better way to produce these large statement pieces that is beneficial for the buyer and me. After lots of thought, here’s what I came up with – make a large scale printable sign that can be downloaded, printed as an engineering print, and made into a sign. So, this My Favorite Things printable sign is the first in a collection of large scale printables that I will have for sale in my Etsy shop for just $9.95. There is no shipping, because you simply download the image to your computer. Click HERE to purchase this My Favorite Things Printable Sign. People who visit your home will think this is a hand painted sign, it looks so good! Once your have the sign printed as an engineering print at your local office supply store, you just need to apply it to foam core board and add a frame. I got a large piece of foam core board while I was at the office supply store that was big enough to attach the print. The foam core just provides stability for the engineering print. I used a general purpose spray adhesive sprayed onto the foam core board and then carefully applied the engineering print paper. Work from left to right when applying the print to the foam core board and make sure you smooth out any air bubbles. Once the print is adhered to the foam core board, you can trim the foam core board if needed. The print is formatted as a 24 x 36″ print, which is a standard size for frames if you want to just purchase a frame for the print. But, it’s so easy to make your own frame and that’s what I did. 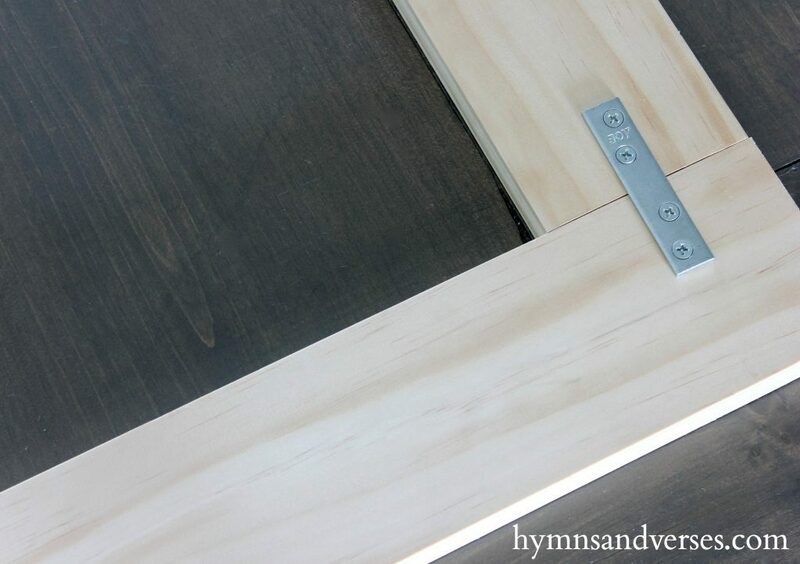 You just need 1 x 4″ wood and a little piece of hardware called mending braces to join the wood pieces together. I didn’t miter the corners, and you just need a screwdriver to attach the mending braces to the four corners, so I was able to make the frame myself – yes, no help needed from the hubs!!! Then, attach a sawtooth hanger to the center top of the frame and it’s ready to hang! I used thumb tacks to attach the foam core board to the frame back. If you do decide to purchase a frame and it has glass, I personally wouldn’t use the glass because of the glare created by the glass and I think it would look more like a sign without the glass. To do this, just take the glass out of the frame, place your print in the frame and put the glass in the frame behind the print (to keep it safe in case you want to use the glass later for another print). I hope that makes sense. Then add whatever backing board that comes with the frame. 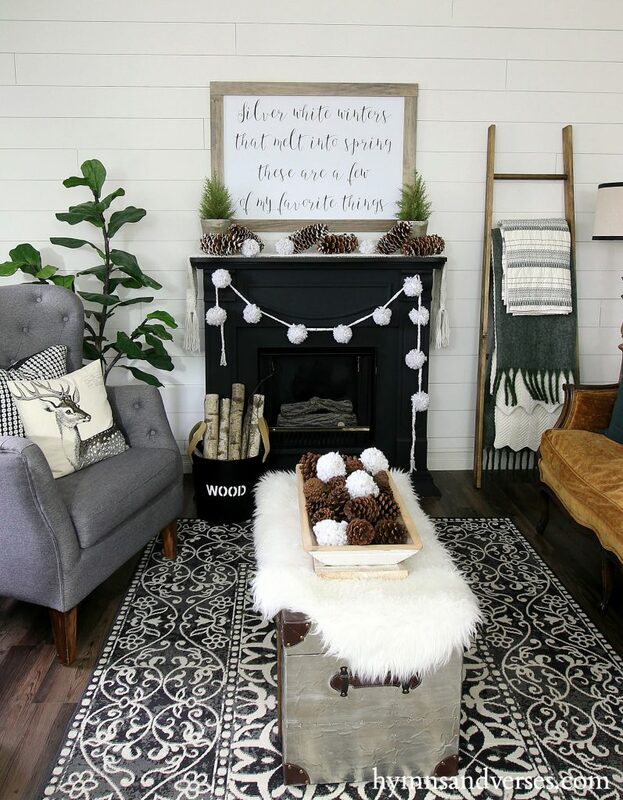 To complete the wintery look on the mantel, I used my pom pom garland that I made years ago! You can see how to make one HERE. 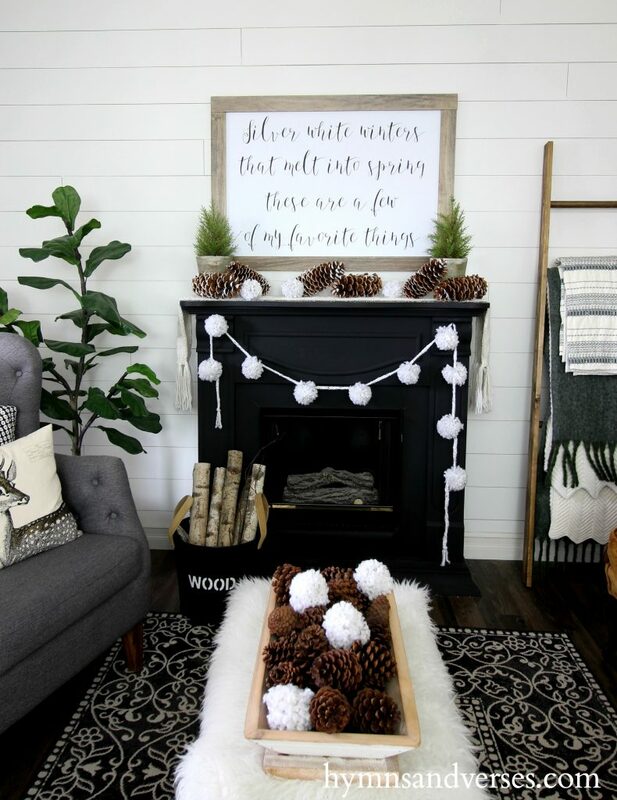 On the mantel top, I used a cable knit scarf as a runner, some large pine cones, and a few more pom poms. 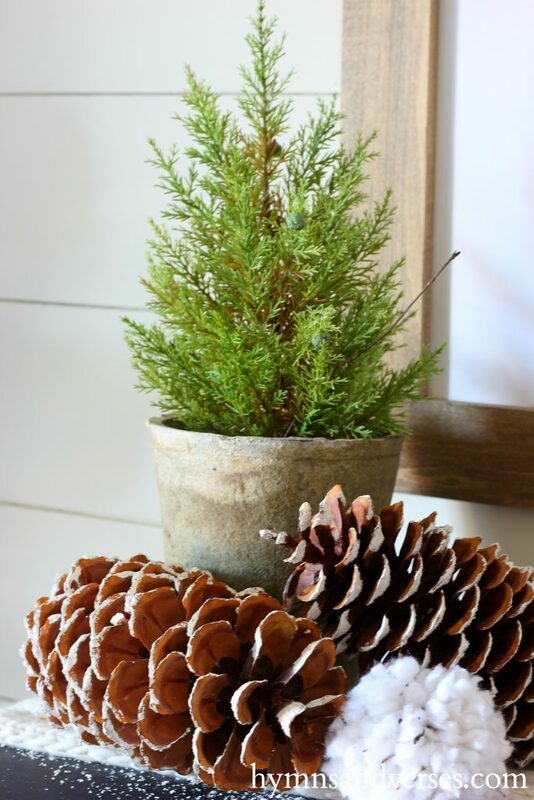 Can you believe these mini cypress trees are faux! I got them at a local specialty shop a few years ago after Christmas when they were on deep discount! This is the perfect time of year to search those kinds of shops for discounted faux greenery. I know most big box stores cleared out their Christmas decor on January 1, but a lot of small shops still have some Christmas/winter decor that they want to clear out to make room for spring. 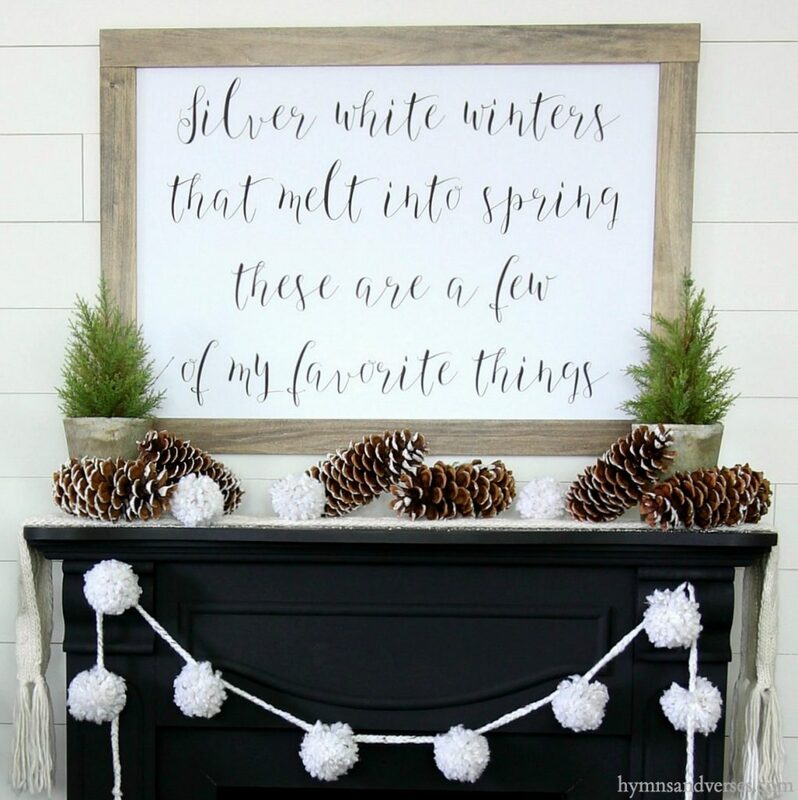 I’ll be back tomorrow to share more winter decor and a FREE printable for my printables library here on the blog. Thanks, Suzanne! I’m going to be changing my previous designs to this format and will let you all know when they are listed! I also hope this is the start of offering more signs with different phrasings. I love this idea. Thanks for blessing your followers with this gift, Doreen! I’m so glad you like this idea, Kathleen! Thanks for sharing! I am printing the saying in chalk on my door with chalk paint, Thank you, again! Share any sale you see on these greens or topiaries. Totally off topic (I love your sign), but can I get more info on that Gray chair?! I’ve been scouring the internet for one’s just like this but have been unsuccessful!! !